Hermosa Cantina is a new addition to the Wembley food scene, situated along Cambridge Street brought to you by the same people behind Tropico, North Beach. It’s a Spanish inspired eating and drinking house presented by George Fowler and Garry Kemp, featuring modern food with local and imported beverages. On a Saturday lunch after work, I head to Hermosa Cantina with my two dining partners to check it out. 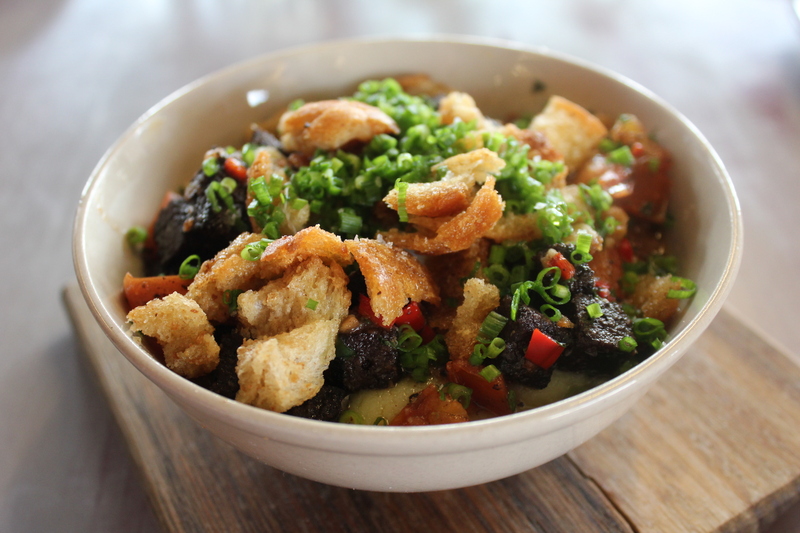 We started off with the slow cook egg, migas, morcilla and potato puree ($11). When you mix everything together, you get an explosion of flavours in your mouth. Plenty of spice with a combination of smooth and crisp textures. What’s a morcilla you ask? I’ll leave that up to you to google it. I had the manchego cheese and truffle onion, grilled “toasty” with red pepper ketchup ($12). This was another recommended dish at Hermosa. I must admit that the manchego cheese and truffle onion toasty was absolutely delicious and it’s probably one of the best toasties I have ever had in my life. 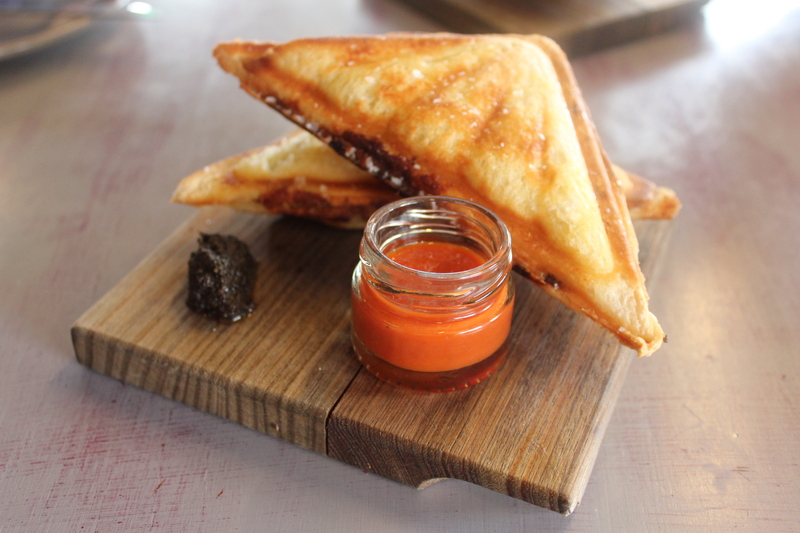 It’s a toastie oozing full of cheesy-ness with earthy flavours from the truffle onion and truffle sauce, finished off with a punch of tang from the red pepper ketchup. My two dining partners indulged on the W.A. 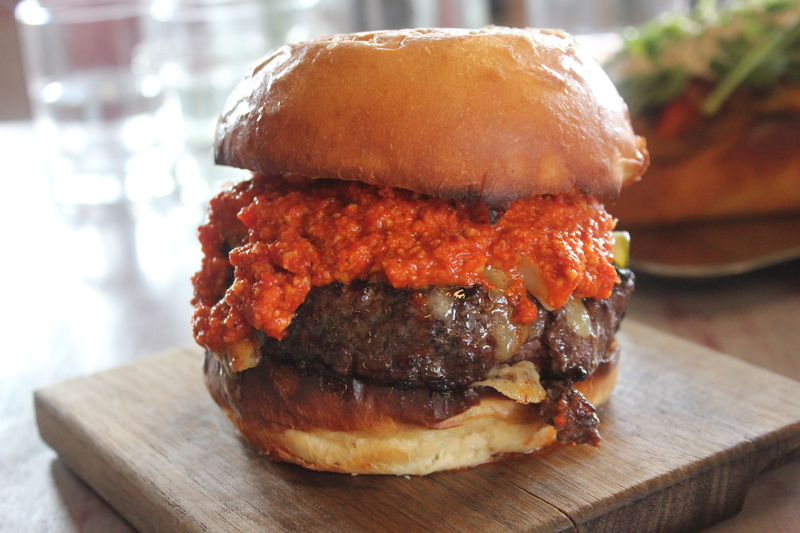 grass fed beef burger, mojo rojo, sheep’s cheese, pickled zucchini, brioche ($19) and the grilled artisan W.A. 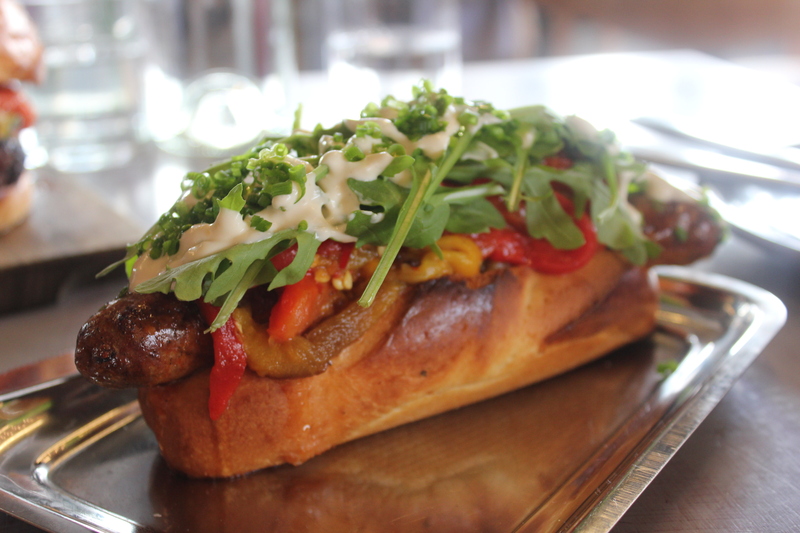 chorizo, marinated peppers, roquette, lemon dressing hot dog ($15). The beef burger is truly indulgent. The mojo rojo sauce drizzling on top of the juicy beef patty is a perfect complement, giving it a hint of freshness, punchy flavours and acidity. The brioche bun is soft and fluffy, adding a sweet texture to the burger. I sneaked a taste of the hot dog and thought that it was as good as the beef burger. The chorizo was marinated to perfection with full of rich flavours. The marinated peppers and roquette with a drizzle of lemon dressing on top gave the hot dog its fresh flavours. 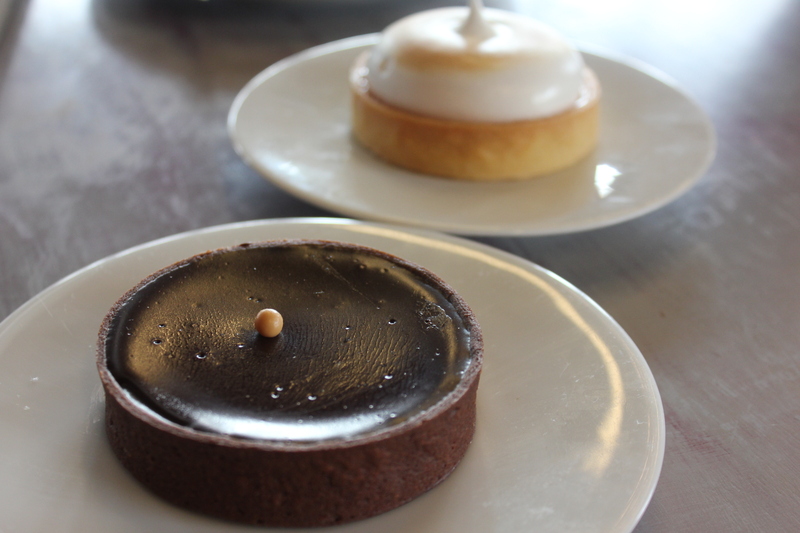 To finish, we decided to share the Lemon Meringue Tart and Caramel Tart. 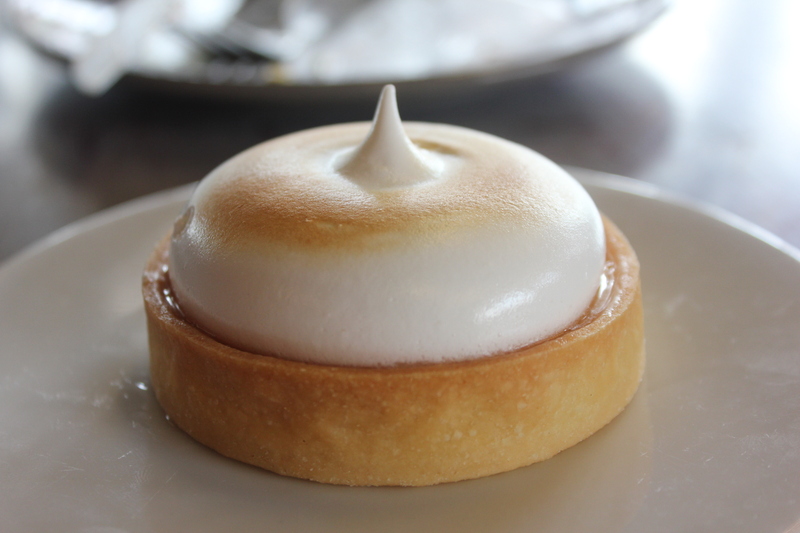 One bite of the lemon meringue tart and you will be taken to foodie heaven. The combination of the soft, smooth textures of the meringue and the fresh, punchy and refreshing flavour is a matchmake in heaven surrounded with a perfect pastry. If you have a sweet tooth and the sound of gooey, sticky caramel surrounded by chocolate together sounds awesome to you, I highly recommend the caramel tart. It’s decadent and very indulgent. Overall, I really enjoyed and had a great dining experience at Hermosa. The service was friendly, excellent and attentive. The ambience and atmosphere is modern, comfortable and welcoming. With great food, service and atmosphere, Hermosa makes a perfect place for brunch, a catch up with friends or a dinner date.